Newly formed mouse adult olfactory bulb granule neurons are imaged with two photon microscopy 2.5 weeks after using a retrovirus to label adult stem cells with EGFP. I am a graduate student working with Drs. Hongjun Song and Guo-li Ming. We are interested in the role of adult neurogenesis and how new neurons incorporate into the adult environment. 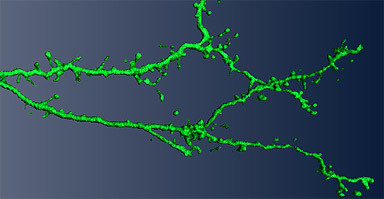 New neuron incorporation is thought to be important for learning and memory. By labeling new neurons in adult animals, we can visualize how these cells incorporate into the olfactory bulb. We use an LSM 510 Meta Two Photon setup. The ZEISS system allows clear visualization of the complex, elongated dendritic structures even when using the W Plan-Apochromat 20X/1.0 NA objective (apochromatically corrected objective designed for electrophysiology).